I recently had the opportunity to see version 12.2.1 of Oracle’s SOA Suite in action–and I can say it offers some very nice features that we developers have been waiting for. These features will make our lives much easier, especially when working with Cloud integrations, using REST and locating failures in BPEL instances. XSLT Mapping Debug. XSLT transformations now have debug functionality. We can set breakpoints to check a function’s input and output data at runtime. This feature is available for applications deployed in local and remote servers, and for BPEL and Mediator components as well as for OSB projects. In-Memory SOA. When we create a BPEL in JDev, a new tab called In-Memory SOA lets us choose from three persistence options: immediate, deferred and faulted. This functionality uses Coherence cache associated with WebLogic Server to run non-transactional short-running BPEL processes in-memory. This helps improve performance, lighten the DB job and make its maintenance easier. State data is stored and read from Coherence cache according to the option we choose: Read the complete article here. Thanks to the product management team the latest SOA Suite 12.2.1 VirtualBox image is available for download here. This VirtualBox appliance contains a fully-configured, ready-to-use SOA Suite 12.2.1 installation. All you need is to install Oracle VM VirtualBox on your desktop/laptop and import the SOA Suite appliance and you are ready to try out SOA Suite 12.2.1 — no installation and configuration required! Please check the Introduction and Readme document for detailed instructions on downloading and importing the VirtualBox image. Get the VirtualBox image here. For external JSON based REST service let us use a dummy Read the complete article here. Here is a quick overview of some of the new features of Oracle SOA 12.2.1 that we are excited about. We are looking forward to using the new features with our customers; they will provide significant benefits! Failing instances consume resources and slows down SOA servers. This was problem in prior releases if you have failing instances due to external services issues etc. This enhancement allows you to monitor and suspend upstream services and then resume them after period of time that you configured. This helps in eliminating system outages due to one or more bad services. Note that Circuit Breaker is not enabled by default. Alerts can be sent when endpoint suspended. Another excellent feature is modifying a composite without redeploying, so that pending instances can use updated service using patch artifact (SCA-INF/patch.xml). It creates sparse patch archive. WLST commands are available to validate and apply (deploy) the patch. This feature is only supported in production mode with database based MDS. This is another useful feature for high volume implementations, which uses a coherence cache and configurable write-behind thread to defer DB writes for completed instances. Note that EM only reads from Database, not from coherence cache. Read the complete article here. Enabling AS4–Based Message Exchange – Applicability Statement 4 (AS4) standard is now supported! Adjust the situation that from a business process various service endpoints are invoked, where one of them is shown unstable behavior. The unstable service is regularly for short and sometimes long time not available. This may result in a large number of instances end in the error hospital. At the time that the endpoint is not available, resources are used to process instances which will not end successfully. Failure resiliency solution helps to avoid this situation. The failure resiliency solution is to suspend upstream inbound adapters, or EDN subscriptions, or web services. In the case of web services, clients are given errors right away. In the case of EDN and Adapters, messages wait in directory/queue/topic etc. until the endpoint is resumed. IWS can also help in this situation (see also my IWS blog). Use IWS to examine what happened at various points in the business process to analyze the behavior. By default, failure resiliency is switched off. Zo to start using it, the first step is to enable failure resiliency. You can enable it globally (as shown below). Each downstream endpoint inherits this configuration, but you can override it for an endpoint. Read the complete article here. SOAIncomingRequests_maxThreads is a property indicating the number of threads available to handle incoming requests. It is by default set to the same value as the connection pool size of the SOADataSource. This might not be enough for REST/JSON services. You can find this setting by going to the MBean browser, Configuration MBeans, com.bea, SelfTuning, (domain), MaxThreadsConstraint. You can use untyped JSON in various BPEL activities such as assign and assert activities. Since the JSON is untyped, you can assign values to elements which do not exist yet and they will be created; there is no message definition. Payload validation will cause a NullPointerException. Read the complete article here. On the 25th of October at Open World 2015, Oracle released the 12.2.1 version of SOA Suite 12c. This release is full of resiliency updates on the operation side of life. The operations of integration are critical and Oracle listened to the business requirement of customers while developing this release. Here are few of these operations. Usually many hardware/software systems are managed by a small team. With minimum need for admin intervention an integration needs to run silently, automatically and smoothly. When things do go wrong, a console is needed that quickly allows identification and resolution of exceptions. Without a lot of admin training it should be relatively simple to manage integrations. An integration needs to scale, perform and provide continuous availability to process high workloads. Ability to patch applications/composites for emergency fixes. It isn’t the first time in the life cycle of SOA Suite 12c that Oracle is working on the operations of the product. In the previous 12.1.3 release Oracle already targeted the IT operations. Read my blog about it for more details. But for a quick reference, here are the major updates. Auto Purge: Old data past the retention point are periodically on schedule to be automatically be purged. Modularity Profile: Startup time and memoty is reduced by starting up components that are used (depends on the selected profile). Lazy Loading: Startup time is reduced by loading composites only on first use. Centered Error Hospital: The EM is reworked to be centered around exception conditions instead of business as usual, including a centralised Error Hospital. Better Flow Trace: A flow trace with multiple composites shows both in a single trace for better troubleshooting. Work Managers: Simplify and improve thread tuning by switching to work managers. In 12.1.3 it is possible to assign a work manager per soa-infra partition. Now in this 12.2.1 release Oracle has targeted the IT operations again, but with more focus on resiliency. First lets look at the major updates. Circuit Breaker: Improved resiliency when downstream services go down by suspending inbound services. In-Memory SOA: Optimize performance and scalability by reducing database growth. Integration Workload Statistics: Diagnostic tool for analysing performance similar to DB AWR. Parallel Deployment: Faster SOA and Service Bus startup time. Composite Instance Patching: Patch (long running) instances immediately without redeploying new composite version and stalling instances. Automatic Service Migration (ASM): Reduce the failover time and amount of machine resources needed for deployment. Lets look at them in more details in same order as above. A problem we all have experienced is when services more downstream get unavailable cause instances to failt and fill up the error hospital. Manual recovery is sometimes difficult and time consuming. These failing instances consume unnecessary resources. Because of these failing instances the operational costs to recover instances in the error hospital are greater. There is also a potential instability of the system due to the errors on business critical instances. 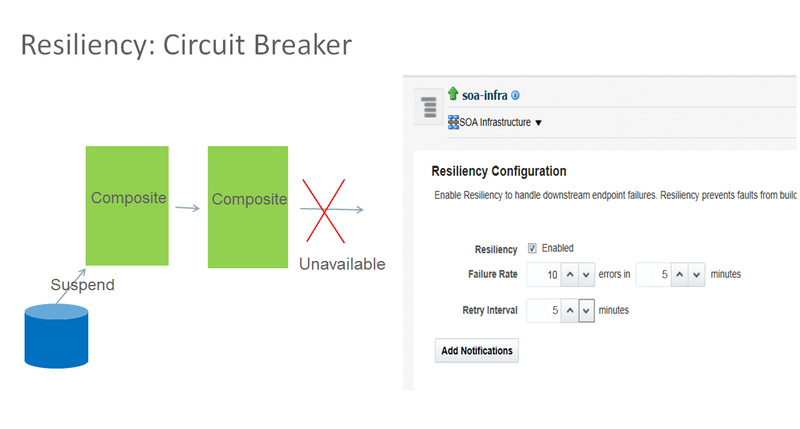 In the 12.2.1 release Oracle introduces Circuit Breaker. It automatically suspend upstream inbound services and the messages are added in queues on disk for later processing. The inbound services automatically resume when the downstream service endpoint is up. Read the complete article here. Oracle has just released SOA Suite 12.2.1 which contains several exciting new features. The below entries have shamelessly copied from the developers guide in order to provide a quick overview of highlights for this release of the SOA Suite. Also at the end of the article some links for new features of WebLogic Server 12.2.1 which has also been released. Oracle SOA Suite 12c (12.2.1) supports Composite Instance Patching, which enables you to patch running instances of a composite and recover faulted instances after patching the runtime. You can only include those fixes in the patch that are compatible with Composite Instance Patching. Use the SOA Patch Developer role in Oracle JDeveloper to make the fixes and create the patch. Composite Instance Patching enables you to deliver urgent composite fixes that can be picked up by long running instances. You can make compatible/allowed changes without aborting in-flight instances. If a patched running instance comes across a business process that has been fixed by the patch, say a BPEL transformation, then it picks up the fixes applied to the business process. Non-schema related XSLT changes, changes to fault policy, sensor data, and analytics data. Compatible BPEL changes such as transformation activity, assign operations, etc. You can leverage the Coherence cache associated with WebLogic Server to run your non-transactional business processes in memory. This improves performance and scalability for these business processes, as read and write operations are performed out of the cache. Database performance and management also improves, as the costs associated with continuous disk reads and writes are significantly reduced. In-memory SOA enables short-running processes to live in memory. The process state gets written to the database only when faulted, or at regular, deferred intervals using a write-behind thread. The BPEL state information is dehydrated and rehydrated to/from the Coherence cache. Starting in 12.2.1, you can debug your XSLT maps using the SOA Debugger. You can add breakpoints at strategic locations in the XSLT map. When debugging, the debugger halts execution at the breakpoints, enabling you to verify the data and output. XSLT maps can be complex, making them difficult to debug. For example, you may have a Java function, or other functionality, that is best tested in the application server. Also, you might find it easier to debug in the application environment, as the XSLT may be invoked from many different applications in the server. The SOA debugger provides remote debugging capability for XSLT maps that have been deployed in the application server. You can also use the debugger with your Oracle Service Bus projects. Become hands-on trained in the latest features of SOA Suite 12.2.1. You will learn in one comprehensive day all about the latest new features of SOA Suite 12.2.1 including live demos of the Integration Cloud Service. Goal after the workshop is to sell your customers additional services e.g. upgrade them to the latest release.